Katherine Muccio of Ridgewood and Grace O'Shea of Ramapo threw down two of the greatest performances in state history, and Ridgewood, Union Catholic and Bryanna Craig of Millville all turned in sensational times and marks at the Arcadia Invitational that concluded on Saturday night in Arcadia, Calif.
Muccio won the 300-meter hurdles in 43.13, which is No. 4 all-time in NJ history and a Bergen County record, and O'Shea was second in 44.05, No. 6 all-time in state history. Muccio and O'Shea are both headed to UPenn next year. Only Olympian Sydney McLaughlin of Union Catholic, who ran a national record 38.90 in 2017, Krystal Cantey of Winslow, 41.19 in 2005, and Eusheka Bartley of Highland Regional, 42.82 in 1991, have run faster in NJ history than Muccio. Muccio and O'Shea were very busy over the two-day meet. Muccio also ran on Ridgewood shuttle hurdle squad that finished first-place in the seeded shuttle hurdles race in 1:01.71, which is No. 3 in Bergen County history, and ran on the distance medley relay team that placed 11th in a NJ#1 12:10.17. O'Shea finished sixth in the 100 hurdles in a NJ#1 14.11 and ran on Ramapo's sprint medley relay that finished ninth in a NJ#1 4:13.95. The remarkable Craig nearly broke the freshman national record by placing second in the heptathlon with 4,791 points, just 143 points off the freshman national record and is US#2 this season. Craig'won the long jump (5.18m), tied for second in the high jump (1.60m), placed second in the 200 (a NJ#1 25.60), second in the 800 (2:23.35), third in the 100 hurdles (14.88), fifth in the javelin (31.69m), and sixth in the shot put (9.05m). The Union Catholic girls had a sensational meet with sevreal NJ#1 times.. 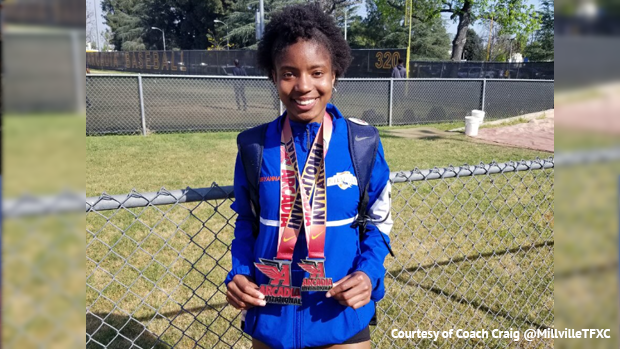 Junior Leena Morant ran a NJ#1 2:11.88 to place fifth in the 800, ran 55.5 on the sixth place 4x400 that ran a NJ#1 3:51.87, and split 2:13.9 on the NJ#1/US#3 4x800 that ran 9:13.96. Also for the UC girls, Jerika Lufrano the indoor Meet of Champions 1,600 winner, finished sixth in the mile 5:01.87 and split 2:18.9 on the 4x800. Tucker also burned a NJ#1 12.31 to place ninth in the 100 dash, and A'Liyah Thomas hit a NJ#1 mark of 17-10 3/4 to place 10th in the long jump. The Vikings also ran a NJ#2 1:01.37 to place fourth in the invitational shuttle hurdles, and placed fifth in the 4x200 in a NJ#2 1:41.70, and Hope Handlin cleared n NJ#2 10-7 to place 11th in the girls vault. In the boys competition, Ridgewood burned a hot sprint medley by placing second in a NJ#1 3:32.23. Ridgewood's four runners were Alex Ruhl (22.3), Luke Reinke (22.9), Ryan McKenna (51.6), and Dartmouth-bound Will Baginski (1:55.0). Baginski won the 1,600 at the Meet of Champions this past winter. Ridgewood was also 13th in the 4x800 in 8:16.16. Union Catholic junior Elijah Brown, the indoor Meet of Champions 800 winner, ran a NJ#1 1:53.94 to place sixth in the 800. UC also ran a NJ#4 1:02.88 to place second in the boys invitational shuttle hurdles, finished fifth in the boys 4x200 in 1:32.30, and 12th in the boys 4x800 in 8:15.66.